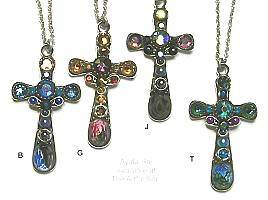 This page shows an exciting assortment of crosses in jewelry and gifts...this is just a sampling, be sure to check Ayala Bar for an extensive selection in pendants. Ornate cross shape measures 2 x 1-1/4 inches, with curving ends. Comes on adjustable 18-22 inch steel chain. All have scrolling metal accents with bead and crystal mosaic designs. Each includes a patterned fabric under faceted glass at the top, and some special detail at center. (G) is monochromatic golds, (M) is deep turquoise, blue, red and gold; (S) is lavender and silver. Only available as in pulldown list. Ayala Bar crosses made on plated metal, rich with tiny glass and crystal beads, prints under glass, steel chains with lobster clasp and adjustable length. Made in Israel. Intricate sterling silver cross has a piece of Ancient Roman Glass in iridescent color at its center. 1 inch across, 1-5/8 inches long including attached ring bail. Comes on 17 inch sterling chain. A square setting of sterling silver at the top holds the precious Ancient Roman Glass in iridescent color. Dangling below are flat charms of cross and heart. Pendant is 1/4 inch across, 7/8 inch long including attached bail loop. Comes on 16 inch chain with spring ring clasp. Cross suspended from 16 inch steel chain with lobster clasp and 2 inch extender. The pendant measures 1-1/4 x 3/4 inches in silvertone metal cast frame with ornate ends. Filled with tiny glass and crystal beads in bright colors of tangerine, fuchsia, teal, aqua and lemon-lime. Cross pendant is 1 inch long, 3/4 inch across, set on silvertone metal and suspended from steel chain that adjusts 17-18 inches with extender chain. The mosaic in cross is made with tiny glass and crystal beads in a multicolor design that includes turquoise, coral orange, lime, blue and fuchsia. Small 3/4 x 3/8 inch cross pendant, mini mosaic design in silvertone metal that holds tiny glass and crystal beads in bright multi colors of aqua, lime, fuchsia, and purple. Suspended from steel chain 16-18 inch adjustable, lobster clasp. Petite 5/8 x 3/8 inch cross pendant, dainty design in silvertone metal that holds tiny crystals, seed beads and bugle glass bead in colors of ruby red, aqua, coral and lime. Suspended from steel chain 16-18 inch adjustable, lobster clasp. Ornate larger cross measures 1-1/2 inches across, 2-3/8 inches long, silvertone metal frame has ornate edges. Mosaic details in glass and crystal beads work magic of darker tones fuchsia, garnet, turquoise, emerald and gold. At the center is a faceted glass covering image of woman's face. Suspended from 18-21 inch adjustable steel chain. Nicely proportioned cross with curves measures 1-1/2 x 3/4 inches, comes on 15-18 inch adjustable steel chain. (B) navy/sapphire blues, (G) gold/pink/ruby, (J) black/iridescent, (T) turquoise blue/teal.